Compared to Q2, we followed the advice of those who commented on the first MOVR report (Q2) and included quite a lot of good interesting data that is hard to find anywhere else. Above all, we presented it on a continent by continent basis that made it very interesting, along with some nice data visualization. 2 days after the announcement, over 20 thousand people had downloaded the PDF. This has us very pleased, but, at the same time, it only surprised us to a point. The report comes with a lot of interesting information. For Smartphones, 61% is Android and 31% is iOS Globally. Windows Phone OS represent 6.5%. By end of Q3 iOS 7.1 is still the predominant version, however 30% of iOS traffic is iOS 8. Most Tablets used for web browsing have screens between 9 and 10 inches. Asians prefer smaller screens. Chrome browser usage on Smartphones is growing. iOS smartphones generate 6% of all Chrome traffic. Samsung (40%) and Apple (28%) are the biggest contributors to Chrome browsing volumes for tablets. Chrome usage is growing on iOS devices. 8% Chrome usage on tablets and 6% on Smartphones. Moto G (10%) is the most popular Smartphone in Brazil followed by Nokia Lumia 520 (8%). Windows Phone OS has a significant share of 18% of Smartphone traffic in Brazil. Brazilians also use their tablets in bed. They go to sleep at 10PM. All this and more is to be found in the Q3 report. 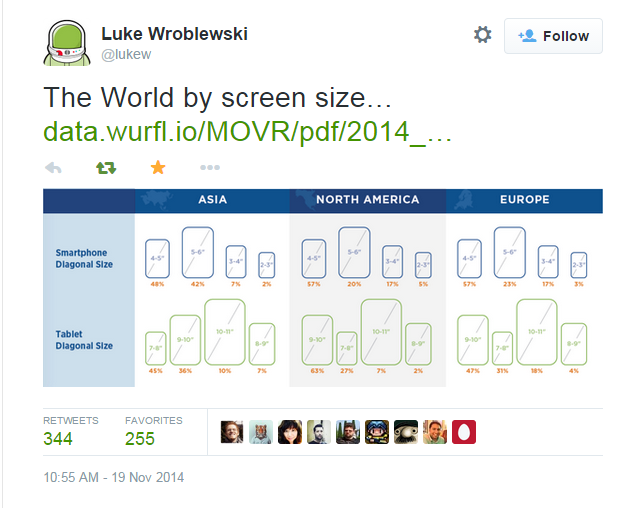 Luke Wroblewski also liked the report and so did many of his followers if we have to judge by the number of retweets and favorites. 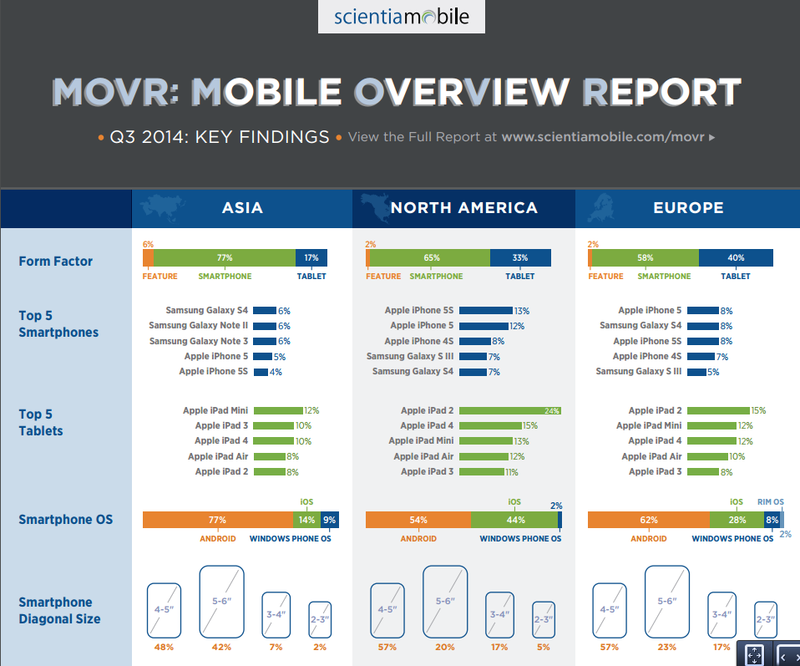 To conclude with the words of the MOVR newsletter (yes, we recommend you subscribe), ScientiaMobile has published MOVR to provide the mobile Web community with timely information about device usage trends. MOVR focuses on smartphone, tablet and feature phone usage, drawn from a sample of our internal data sources from around the world with over 2.5 billion hits. Enjoy.